I'm hoping to get it finished within the next couple of months. I would say month, but I don't see it happening because spring break is coming up and we'll be headed down to Florida with the kids. Sarah is beautiful! Stitching over 1 is so pretty but so slow! she's looking great! Smart to work on the words in the middle and not leave them for last! Sarah is so beautiful. 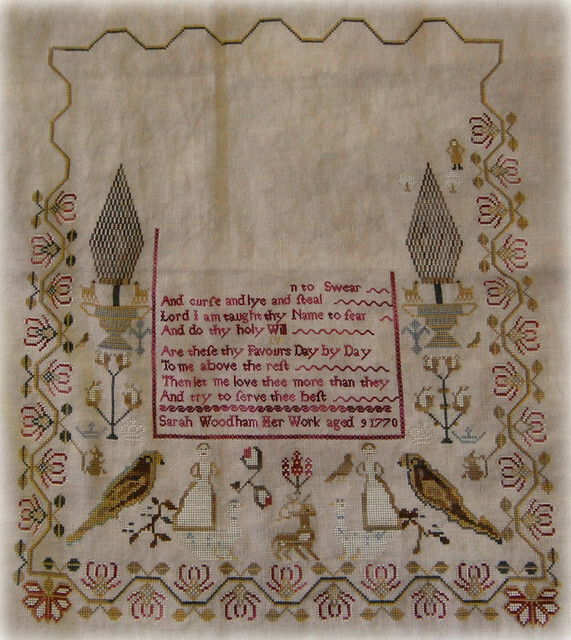 Stitching over one always seems like such a slow going proposition, but it does look very nice. Oh my gosh Nicole....Sarah is coming right along!! Love your work!! Looking wonderful !! Stitching over 1 has got to be tedious. Keep going Nicole! It is soooo beautiful! Really! Keep on going! Sarah is coming along beautifully! The words look grear and the color is beautiful. Aw heck Nicole, who are you kidding it will be done next week....knowing you! More and more beautiful!! Congratulations. Sarah is looking great Nicole, so beautiful! Sarah is looking good. Your are coming along nicely on the over 1. Beautiful stitching!! Have fun on your trip! Sarah is looking great! The verse looks so nice but over 1 on 40 count...yikes! I'll have a little to do this month on my A Wish for You. She is just beautiful, Nicole! You are moving right along on this. Sarah is really beautiful. Sitching over one is sometimes a pain, but it is worth all of the effort - Sandra. Simply beautiful! 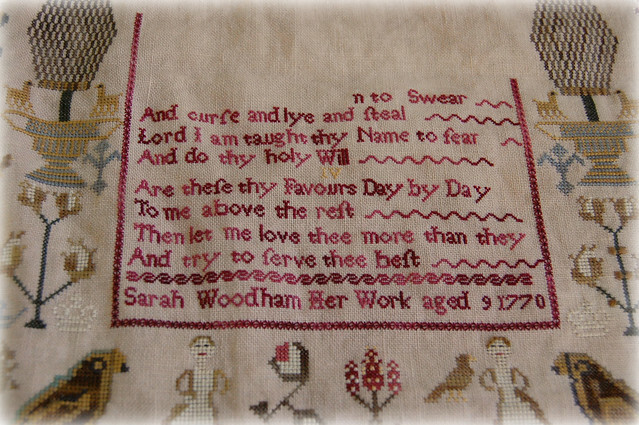 I love this sampler but all that over one is a bit daunting, however that border just sends me over the moon. I feel its pull - LOL! You are just blowing through this!! She is just a stunning sampler. Cheering you on to a finish. Wow, that is a LOT of over-1 stitching. Simply stunning!!! so so beautiful - love that red in the lettering - have a great trip! Gorgeous! I know that over one is slow going, but she is looking beautiful! And like Margaret said, good idea to work on those now!